we’re Dickon and Emily, and we own and run The Beefsmith. 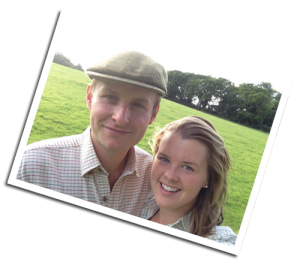 We met at the Royal Agricultural College whilst studying for our degrees in Agriculture and Agricultural and Equine Business Management. Soon we discovered a joint passion for all things outdoors and good food, and the foundations of The Beefsmith were laid. Formation of our herd began in 2012, following the sad dispersal of the long-standing family dairy herd the previous year. After much research into different native breeds, and of course much taste-testing too, we chose the Red Ruby Devon. Being one of the oldest native breeds in the country, they are perfectly adapted to thrive in the British weather on natural pastures. This made them the ideal candidate for our environmentally sensitive grazing based system. Of course the end product had to be exquisite too, and the Red Ruby Devon certainly doesn’t disappoint on that front. We love our cows and our job (perhaps not when the water pipes freeze in the depths of winter), and we believe this shows in our carefully created fine beef boxes.